I have had the pleasure of coaching many high performing athletes in swim, bike and run (triathlon training) that are driven, committed and passionate. But that is not enough. You need to be smart, intuitive and trusting. You need to know what needs to change, and what needs to stay the same. The balance is delicate and often improvement only comes from lessons learnt the hard way. I thought I would ask one of my triathletes who has gone from 10:49 to a 9:07 and 2nd in AG what he has learnt, what has made the difference. This guy is a great choice, because by his own admission he is not a talented athlete. He is a grinder, having no strong leg that he could rely on. Here are some of his thoughts on what it takes. From being self-coached to working with a coach, what did you think were the biggest differences? Any negative things about working with a coach? Working with a coach brought my training structure, specificity, and an overall strategic direction to preparing for Ironman that took my racing to a level I thought was well beyond my capabilities as an athlete. Accountability and pushing myself in training were never a problem as I’m pretty driven when I have a goal, but I look back on how I trained before and realise now how badly it was lacking direction. 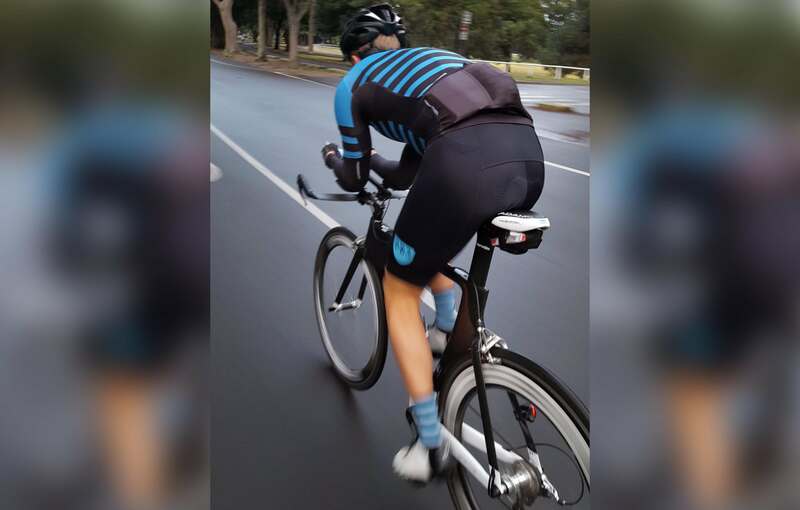 I had no understanding of the importance of training zones, using a power meter on the bike to ensure you run well, or how to effectively structure and periodise an Ironman build to ensure peak performance. I think the biggest thing that coaching provides is the right dose at the right time. It is hard for a self-coached athlete to be able to do that. Would you agree? For sure! I more or less used to knock out the same sessions week in week out slowly building in pace, intensity and distance across all three disciplines throughout the build, chasing a better number each week to give myself confidence that I was getting fitter and stronger. Looking back, I ended up doing so much of my training in the grey zone as I had no awareness of the importance of specifically targeting sessions towards aerobic, tempo and threshold work. I was nailing 32km long runs at 4.20/km through hilly terrain but then wondering why I could barely break 5min/km in an Ironman race! With coaching I realised that every session in the program had a specific purpose, targeting different adaptions and building fitness and strength in all the right areas. Every session is very strategically placed within the context of an entire program, worked in to build the sort of strength you need at the right time to execute a successful Ironman race. Understanding how every session fit as part of a much bigger picture, designed to piece together on race day for an optimal performance was probably the biggest take-away. I remember you being surprised at two things: the intensity of some of the sessions considering you are training for an Ironman, and that there was not a single week over 20 hours? Definitely. Your program pushed me, mentally and physically, to places I thought weren’t possible. This really surprised me as I always pushed myself really hard in training, when self-coached, but sometimes it takes someone else setting you a challenge to truly take you close to your potential, and I guess this is where the trust comes in. I guess it also gets back to the right amount at the right time with the program but when you consider some of the crazy volume that top AG guys do, I was stoked to not need to punch out big volume stuff or a lot of slow miles. Providing you’re willing to still take ownership of your own journey and not become dependent on a coach, I honestly can’t think of a negative. If you remove performance givens such as consistency, what do you think has been the biggest things that have aided the breakthrough in your performance? Confidence. Everything I mentioned in the previous question gave me the sort of confidence I believe you need to really nail an Ironman race, particularly practicing racing scenarios within training sessions. I used to go into Ironman races with doubt, completely expecting to blow up on the run but just hoping it happened later in the marathon rather than sooner. If you go into a race planning to blow up, I can assure you it’s exactly what is going to happen. It was because I hadn’t trained in a way that allowed me to hit the start line with a clear idea of what I was capable of in swim, bike and run, and how I could combine them in one long day. I had never done any race specific sessions etc. I never had a plan so I was going into races ‘hoping’ – a mindset which will almost certainly manifest in underperformance. Since coaching, I gained a confidence in my ability to plan and execute in a race, and consequently I’ve felt in control in those races. Having that sort of confidence also has a massive impact on the mental side of things. When the hurt starts to come you’re able to stay calm, accept the pain, and push through with the confidence that you’re strong enough to absorb it. What is an example of sessions in the program that you thought gave you the most confidence? I came out of some of those big Saturdays feeling bulletproof. 6 hour rides with 5 x 20min big gear 70.3 efforts and 4 x 3min FTP efforts then a 45 minute run off the bike gave me so much confidence. Just big strength work. Also, I felt that if I could knock out 7-hour training days with a bunch of hard efforts, then a 9-hour race at a more stable intensity would be very manageable. I drew upon those sessions at various stages in the bike and run throughout Ironman Cairns, and they gave me confidence. The Big Day Out is also a good form finder – 4km swim, 5-hour ride and 24km run with various efforts throughout each discipline allowed to me to nail nutrition perfectly. Also, triple run days were tough but also gave me a lot of confidence. What advice would you give to a guy that is dreaming of the Kona spot? It’s interesting what coaching has given me, and how it has exceeded my expectations! I’m not in any way athletically gifted and thought, at my absolute best, I might be capable of jagging a Kona roll-down slot somewhere with a bit of luck. Since working with you, every race (2 x 70.3 and 2 x IM) has been a huge breakthrough, including a couple of 30 – 34 AG podiums (3rd Port Mac 70.3 and 2nd IM Cairns), 6th overall age-grouper at Ironman Cairns, Kona Qualification and a PB Ironman time of 9.07 – results that I previously only ever dreamed about. It is, however, so important that you trust the coach and the program. Once you understand, just do the sessions. It also takes commitment – if you only do 70 – 80% of the sessions, then you’ll only deliver a performance that is 70 – 80% of your potential. Trust the coach, commit 100% to the program, and start believing. I mentioned this earlier, but I think it’s still really important to take ownership of your own journey. Your coach won’t be out there swimming, riding and running alongside you on race day, so it’s important that you make decisions throughout the program without always reaching out to your coach. Of course, if there’s confusion surrounding a session then seek clarification, but calling your coach after 2 – 3 times per week to talk about every session is, in my opinion, building a dependency that will be problematic come race day. The coach is there to provide you with the program and guide you when necessary but remember it’s still your journey and you must own it. You have to know your WHY! I am a huge believer that on race day most people fall apart mentally well before they do physically, so take ownership and build that mental toughness that’s so crucial to Ironman success. Chris Breheny is currently training for Kona in October! 15-week breakthrough programs personally tailored to your circumstances will soon be available for Western Sydney 70.3 and Busselton Ironman and will be strictly limited to ensure success.